Monster Math Pack and Valentine's Day Freebie! 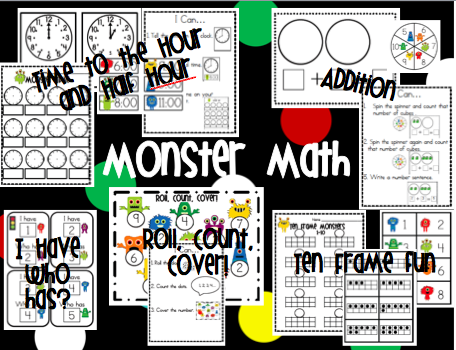 I just finished my Monster Math Pack and am so excited to share it with you! It is over 55 pages of engaging math fun. I included I Can Charts and Student Recording Sheets for each activity except the I Have...Who Has? game. My kiddos have been doing the activities in my class and they just l-o-v-e it! I didn't intend for it to include so much but I got a bit carried away :) Since it is Valentine's Day weekend and I love all my bloggy friends, I am going to give away the Monster Math Pack to the first 5 people to comment on this post. Be sure to leave me your email address. Click the image below to visit my TPT store! Since love is in the air I thought I'd share a Valentine's Day Freebie! My kiddos are obsessed with any type of Roll, Count, Cover game so I made one for Valentine's Day. We aren't making number sentences just yet but I've included a recording sheet if your kiddos are already doing that. Click the image below to download the freebie! Yay!!! I can't wait to use it with my kiddos!! Thanks SO much! Your monsters pack is so cute! I would love a monster pack too. I would love a monsters pack! I couldn't tell if you already had 5............thanks! Thank you Jessica!! I love it! I know how much work goes into creating math games so I really appreciate you sharing your hard work with me. I know my students will love these activities! Check your email too, Kelly! Thank you so much, Jessica! This is exactly what we are working on in my class and it will be perfect. So cute! Hi Jessica, I just found your blog and LOVE, LOVE, LOVE your creative ideas! Thank you for the Valentine freebie! I plan on using it this week! So close and yet so far from #5! Anyway, thanks for all of the sharing you do. Your ideas are fabulous!! PS...I'm your newest follower:) Great Blog!!! I love both of the items for sale. So cute! Hi - I love your cute packs you make! Your blog is fantastic too. I am your newest follower. I'm new to blogging and really enjoying meeting everyone. Pop on over and check out my blog and tell me what you think. You have lots of people ahead of me. But, I just saw this on my Facebook page. I am hoping you will be generous and grant me a freebie! Otherwise, I am going to follow your blog.